An invitation to attend the 2015 Mayoral Music Industry Forum has been extended to all interested members of the Nashville music industry. 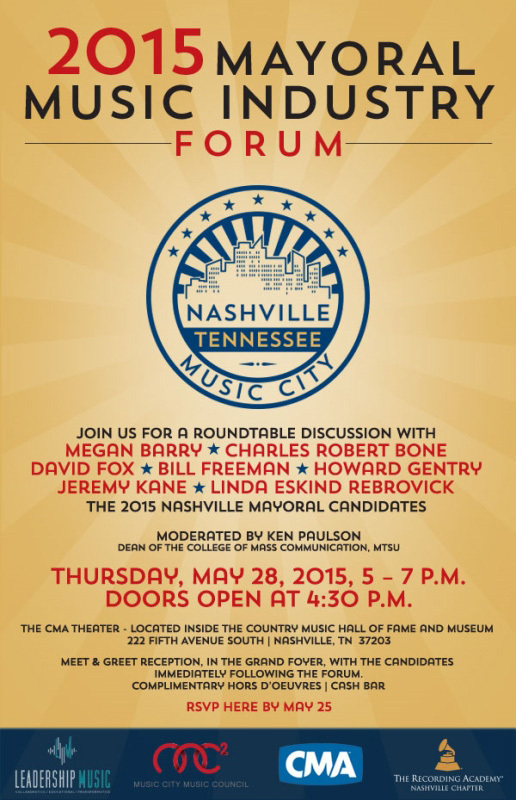 Created by the CMA, Leadership Music, The Music City Music Council, and NARAS as an important forum for their members, the event, now open for all music industry members, will be held Thursday, May 28, 2015, from 5 p.m.-7 p.m. at the CMA Theater inside the Country Music Hall of Fame and Museum. All interested attendees should RSVP here. Moderated by MTSU Dean of the College of Mass Communication Ken Paulson, the roundtable discussion will include mayoral candidates Megan Barry, Charles Robert Bone, David Fox, Bill Freeman, Howard Gentry, Jeremy Kane, and Linda Eskind Rebrovick. The event will include a meet & greet reception with the candidates in the grand foyer immediately following the forum. The forum will include complimentary hors d’oeuvres and a cash bar.